This week i’m talking about making another shirt. I actually finished this one before my 1860’s blouse, which means it’s the first structured shirt i’ve ever finished! I think I made a few jersey shirts when I was cosplaying, and i’ve made partial shirts/corset covers recently, and tons of chemises, but never a proper structured shirt. Then last week I made two! Which is a big accomplishment for me. This shirt is a proper shirtwaist. I based it mostly off of this example, but I searched for shirtwaist advertisements before starting just to get a better idea of the silhouette. 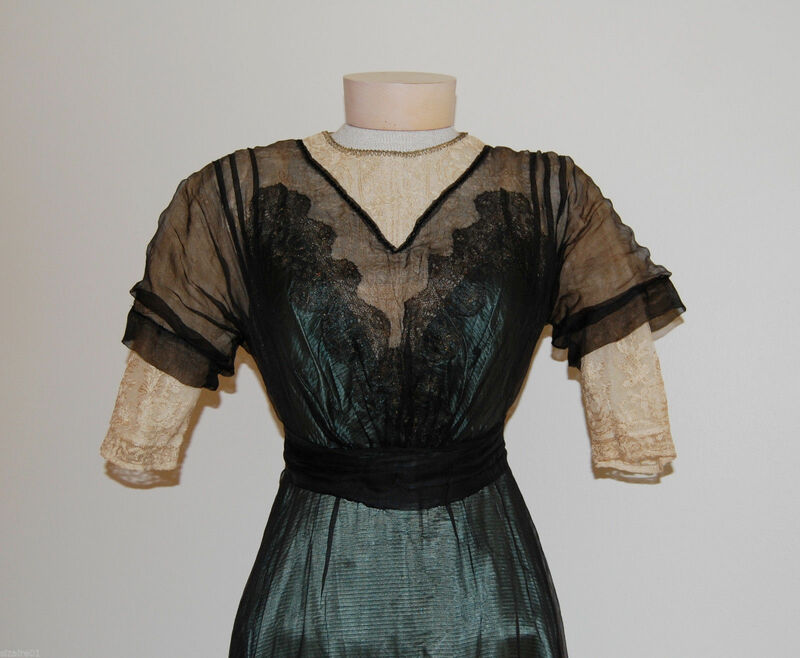 This shirtwaist is going to be part of my 1890’s cycling ensemble, but the shape and sleeve design is a lot closer to what would have been worn in the early 1900s since I find them a lot more visually appealing. And before getting started I wanted to mention that I also filmed the process of making this shirtwaist. So if you’d like to see me sewing it and describing the process in a bit more detail then you can watch the video here! For this project i’m using two and a half yards of striped cotton shirting, and vintage shell buttons I picked up on etsy. I started by draping the pattern. This would have been really easy to flat draft but I was feeling lazy. Once taken off the dress form I had something that looked like this. It’s rough around the edges but surprisingly it looks a lot like the shirtwaist patterns I found online. One is posted here, and another with more photos is here. I’d planned on linking to a few paper patterns for shirtwaists but weirdly I couldn’t find any, which i’m assuming is because they are so easy to self draft. The closest things I could find are linked above, but I know the The “Keystone” Jacket and Dress Cutter * has drafting instructions for a couple styles (along with sleeves and collars). I smoothed out the edges and added seam allowances. Then I made a sleeve and cuff pattern. I chose to make the sleeves one piece with a dart from the elbow to cuff, which probably isn’t historically accurate, but when it’s worn you can’t even tell. I cut the sleeves out. Then added the dart. This was sewn with a french seam so raw edges weren’t visible on the interior. I turned the edges of the cuff inward, then fused interfacing overtop to give them a bit more structure. Then the lower edge of the shirt was gathered down and pinned to the cuff. I sewed the cuffs on with slip stitches. Then turned the lower eight inches of the seam allowance inward by a quarter inch. Then inward once again to hide the raw edge. I sewed this down by hand with whip stitches. Then I sewed lining into the cuffs and snaps to keep them closed. I used snaps for all the closures on this project, since the buttons I picked are really tiny and there was no way I could make buttonholes that small without them looking awful. The snaps definitely aren’t historically accurate, but they do make it easy to get the shirt on which I appreciate! The final touch were three shell buttons on each cuff. I gathered down the top edge of the sleeves and that was it, they are finished! After cutting out the bodice panels I used red thread and basting stitches to mark the pleat points. Then I turned the front edge inward by a quarter inch. I covered that edge with a one inch wide strip of interfacing, then turned it inward once again. Then the panels were pleated. I started at the center front and pleated towards the side seams. The thread marks made this really easy to do. The process was repeated on the back seam. After doing this I sewed across the pleats by machine with two rows of stitching. Then the basting stitches were removed and the pleats were ironed. Buttons and snaps were sewn onto the two front panels. This took me ages since the snaps are so tiny. 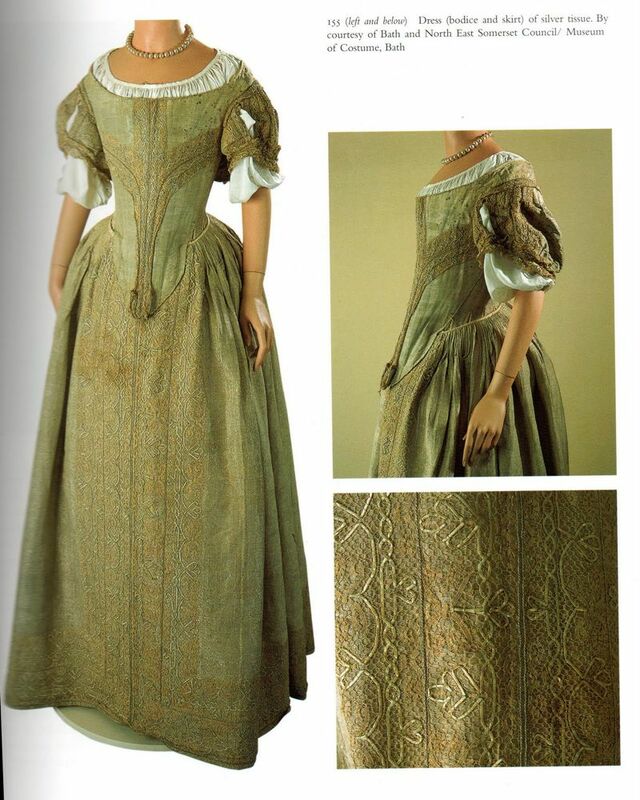 The bodice panels were sewn together at the shoulder with french seams. Then I turned the neckline inward by a quarter inch, then inward once again. It was sewn down with whip stitches to keep it in place. With that done I sewed on the final snap and button. The sleeves were sewn on with a half inch seam allowance, then I covered the raw edge with lace binding. After that I did up the side seams with french seams – the side seams were sewn from the hemline to several inches above the cuff (to the point where the edge was turned inward, which leaves an opening to get my hand through). I hemmed the shirt by machine and that was it! Well…kind of. The shirt was wearable at this point, but I wanted mine to have a collar. So I made one out of cotton sateen. It’s two layers of material that were sewn with the right sides facing each other. Then it was turned the right-way out and the bottom edge was finished with lace tape. I sewed that onto the collar of the shirt and now it’s really done! I think it looks quite nice. I really like the sleeve volume and the proportions of this. It’s a bit big in the waist (which could be fixed with the waist ties/belt that were usually worn with shirtwaists ) but that isn’t a big deal at all. I think it looks pretty good for being my first real shirt. And it’s definitely the most comfortable piece of a historical costume i’ve ever made. The fabric is thin enough to hide the corset, but light enough that you can feel a breeze through it. I wore it for around three hours last weekend (along with a pair of flannel pants, full length socks, a corset, combination chemise set, wig, and wool hat) when it was 80+ degrees out with very high humidity and managed to stay pretty comfortable. So I can definitely see why these were paired with sporting costumes! However as much as I like it, it still didn’t seem quite finished. And that’s because it was missing a bow. I made the bow for this by folding a two inch wide ribbon into this shape. (Isn’t that a great description?) I basically fiddled around with the ribbon until it started to look like a bow. This is it from the front. And the back. I ended up sewing the ends of the bow to the portion of the ribbon that is folded over. Then I gathered the bow down at the points where stitching is visible. Which turned it into this! I sewed a center overtop of it, then strung thinner ribbon through the center. The ribbon that goes through the center of the bow ties at the back of the neck…which is honestly a pretty bad design. The ribbon is prone to slipping which makes the bow droop, which makes the collar loosen, which makes the neck look wider. It isn’t a huge deal, but once I got home and after wearing the costume and looked at photos of the ensemble I realized the problem right away . Luckily that can be fixed by creating a tie that snaps or hooks closed. Here it is with it’s pretty little bow~ It’s so perky looking I love it. And here it is with the matching wool jacket! It’s all starting to come together and I love how it looks so far. And that’s it! Sorry if descriptions and photos were a little vague this time around, since I filmed making it I didn’t tak as many photos as usual. This post is the second one about making my Civil War Era evening gown. Part one talks about making the bodice and can be read here. This post will cover the process of making the sleeves and include photos of the finished bodice. I really enjoyed this part of the project. Puffy sleeves are relatively easy to make and don’t require too much precision or fitting (unlike most sleeves). Plus they are adorable. Something about them makes me ridiculously happy. These ones are ecspecially frilly and detailed, which made them even more fun to work on. The first step was drafting a pattern. Since this bodice sits off the shoulder I didn’t have to worry about fitting a sleeve cap, which made the process way easier. I cut the pattern out from cotton sateen, then pinned lace appliques onto the lower half of each sleeve. After sewing the appliques on by hand I cut out the tulle overlay. The tulle overlay consists of two layers of gathered tulle (one layer is white, the other is ivory – when layered the create a warmer white tone, which better matches the lace used on this costume). I didn’t use a fancy pattern for the overlay, I just cut out strips of tulle that were one inch wider than the widest point of the sleeve, and three times the sleeves length. Then I used my machine to gather the edges down to the sleeves length. I pinned the overlay on and trimmed any excess material at each edge. Then I sewed the overlay down. This is the same process I used on the collar. The tulle really dulls the appearance of the lace, but the lace is still slightly visible and adds a lot of texture to the sleeve. Then I gathered down the top and bottom edge. And now it was time to create the “paned” effect. I did this by cutting out one inch wide strips of cotton sateen. The edges were ironed inward then covered with interfacing to stiffen them and hide the raw edges. Then they were pinned onto the sleeves. I secured them by sewing across the top and bottom edge – they look a bit silly here, but after steaming them they started behaving a bit better. I also covered the top edge with lace ribbon to hide the raw edge. Now it was time to work on the cuffs. Each cuff was made from strips of cotton sateen that were folded in half. I sewed a quarter inch away from the folded edge to create a channel. Then I filled the channel with a piece of plastic boning. This helps the sleeves keep their shape. I gathered down some chantilly lace (these were the scraps leftover after trimming lace for the collar) to create lace ruffles. Then I sewed those onto the hem of each cuff. I still felt like the cuffs were missing something so I added a bit of beading. I used glass seed beads and white fake pearls for this. They were sewn onto the sleeves with a half inch seam allowance. Then the raw edges were turned inward and covered with more lace ribbon. The side seam was sewn up with a french seam, and that was pretty much it! The final step was adding a bit of alencon lace to cover the topstitching on the cuff. The sleeves were sewn into the bodice by hand, with a slip stitch. Then the top edge was whip stitched to the lining. This is the finished interior of the bodice. The back currently looks like this. After taking this photo I realized the sequins don’t extend all the way to the center back, so i’ll need to fix that. And i’ll probably have to add a modesty panel at some point. But other than that it’s finished! Here is how it looks worn – these were taken on a very overcast day, and my lighting isn’t the best, so I apologize for that. But hopefully you can get an idea of how it looks! I was seriously thrilled when I tried this on because it fits! I was worried the shoulder would be too small, and I was concerned about the waistline, but both those things are perfect! In addition to liking the fit, I also really like how it sits on the body. 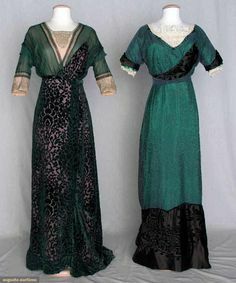 One of my favorite things about historical fashion are the ridiculous proportions, and how effectively they create a flattering silhouette despite the overwhelming amount of fabric, ruffles, and lace. I think this is a good example of that. I think my only regret with this bodice is that I didn’t made the front point longer. From the side the point looks quite dramatic (it extends six inches past the waistline). But from the front it doesn’t look long enough. I’m not too upset about it, but it’s something to keep in mind for future projects from this period! But I am a bit peeved with how the lace ruffle abruptly ends. I think I need to add a bow to cover that since I don’t have anymore of this lace. And that’s it! This is probably my favorite bodice i’ve ever made. It’s so frilly and lacy and sparkly, I can’t help but adore it. The design of it is also quite special to me since i’ve had this project planned for so long. I was worried I might be disappointed by the end result since I had this project built up so high in my head, but so far it’s surpassed all my expectations and I hope it continues to do so! Today i’m blogging about another bodice that I have in progress. This one is based on one of my favorite 19th century dresses, which was worn by Countess Anna von Hallwyl in 1865. 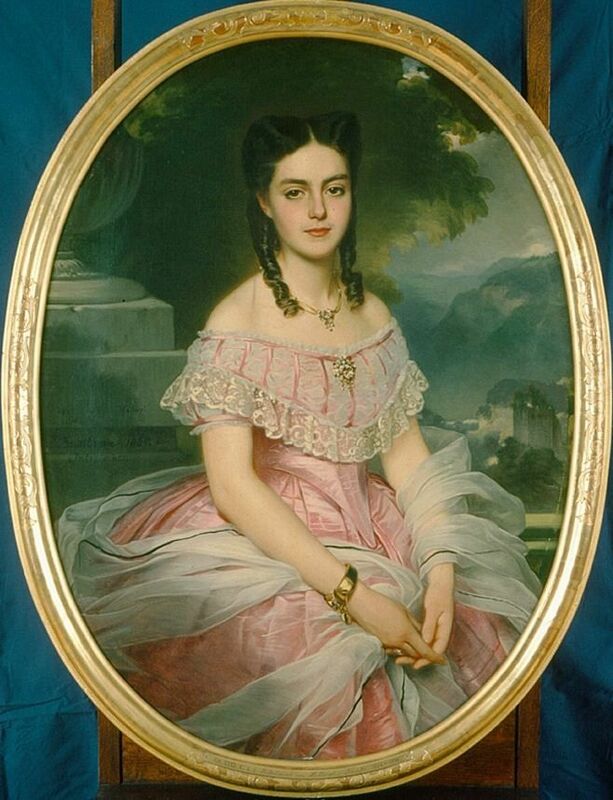 The portrait of her wearing it can be seen here, and the actual dress can be seen here. I’m pretty sure that’s the same dress, but the exact details are hard to track down since the gown is part of a swedish museum archive that doesn’t allow english search terms. 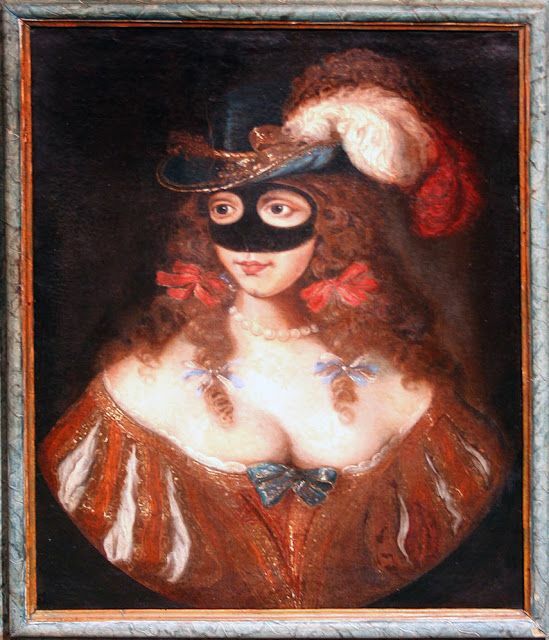 I discovered this painting years ago, before I was even making historical costumes. I was instantly charmed by it and those feelings haven’t changed at all. 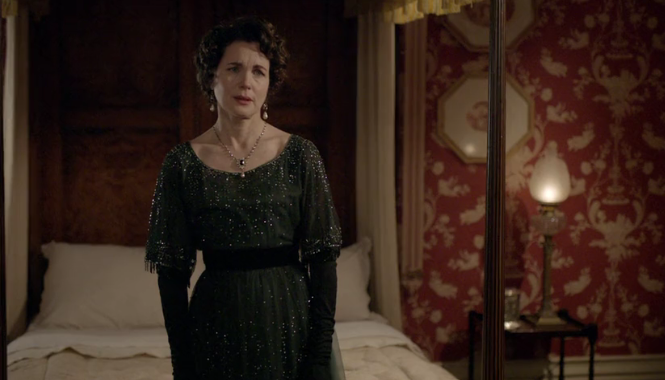 I still adore the dress and think it’s a really interesting example of 1860s fashion. I love how it has the traditional bertha style neckline, but instead of being created with pleats or ruffles it’s ruched! And the banding details on the collar carry over to the sleeves, which create a paned effect that dates back to renaissance times. I bought fabric for this project shortly after seeing the painting for the first time, but I didn’t have the confidence to make it until now. So i’m very excited to finally be working on this gown. Even though this project is based on a specific painting, and has the same color scheme, i’m not aiming to recreate the dress linked above. The finished project will be a mixture of elements from the Boutibonne painting and my own design choices. But the similarities are pretty clear in the bodice! Since one of my favorite things about this dress is the collar, that will be prominently featured in the version i’m making. Here is the sketch that I started out with. And a full length sketch. I started by draping the bodice, then turing it into a paper pattern. At this point I realized the collar would have to be a bit wider, and the neckline a bit higher than I had originally planned. I made a mock up to check the fit, which made it clear that some alterations were needed. I lengthened the basque waist and trimmed a half an inch off the waistline. I took in the front seams by half an inch, lowered the shoulder by a half inch, and made a few alterations to the arm holes. Overall these are pretty major changes, but at this stage they were easy to make. After fixing the pattern I began cutting out the bodice. The bodice has two layers – a top layer of pink cotton sateen, and a base layer of stiff cotton to prevent the top layer from stretching. My fabric choice for this project was kind of poor (in my defense I made it three years ago when I had way less fabric knowledge) the material is too lightweight for the bodice, so I backed the cotton sateen with lightweight fusible interfacing before cutting it out. I created boning channels on the front and side panels with twill tape. The boning channels are visible on the front panel (sewn after attaching the cotton sateen to the stiff cotton layer) but the side ones are hidden. This bodice will be worn over a corset, so the boning isn’t for reduction purposes. It’s just to support the bodice and keep the material laying smoothly over the body. I sewed the right sides of the sateen/stiff cotton layers together around the arm hole, so once they were turned the right way out I had a finished edge. Then I hand stitched around the edge to keep it in place. The bodice was sewn together by machine with half inch seam allowances. A few things didn’t line up as well as I would have liked, but overall i’m happy with it. I boned the bodice with quarter inch steel, then sewed an alencon lace applique to the front. This lace was another one of those bad material choices, since alencon lace looked very different in the 1860s and wasn’t common at the time. But I love this fabric and it matches perfectly, so i’m using it anyway. I folded the bottom edge inward by a half inch, then sewed piping to the edge. I tried doing this a few different ways with various sizes of piping, but this looked the best. When the bodice is worn tension keeps the piping smooth and it looks symmetrical. When it’s flat the piping does it’s own thing and it looks like this, which is a bit unfortunate! At this point the exterior looked pretty, but the inside was quite messy. I didn’t want to line it, since that adds bulk to the garment, but I didn’t want frayed edges either. So I trimmed each edge slightly, then whip stitched lace hem tape overtop. this was a little time consuming, but i’m really happy with the end result! Now I could finally move onto the collar! The collar started as a single piece of cotton sateen, which was also backed with fusible interfacing. Then I pinned lace appliques overtop. All the appliques used on this project were fussy cut out from a piece of lace fabric. That lace fabric had borders on each edge, which were also fussy cut out and used to trim the skirt. It’s a much more affordable way of buying lace appliques/trim as long as you don’t mind spending a few evenings cutting it apart! Here the lace is after being sewn on. It looked very pretty at this stage, but unfortunately that didn’t last, because the next step was covering the collar with two layers of gathered tulle. After adding the tulle the lace became really difficult to see. But even though it’s barely visible it still adds a lot of dimension and sparkle to the collar, so I think it was worth doing. I made the bands for the collar out of one inch wide strips of cotton sateen. I ironed the edges inward, then fused a small strip of interfacing over the back side. This isn’t the most secure method, but it was much faster than hand sewing them and it looks much cleaner. The bands were pinned in place two inches apart, but after draping the collar over my dress form I made a lot of changes. I probably spent and hour arranging them until I felt they were perfect. The bands were sewn on by machine. Then the raw edges of the collar were covered with bias tape that was stitched on by hand. Close up showing the lace detailing beneath the tulle. I liked how this was coming along, but it was a bit dull looking. So I did the obvious thing and added sequins. They really do fix everything! They should be advertised as the duct tape of the embellishment world. Now I started adding the frills. The first addition was a scalloped lace from etsy, which was hand sewed around the top and bottom edge. Then I sewed a bit of lace trim to the center of the neckline. I had to sew the lace to tulle, then sew the tulle to the collar to get it to stay like this. Now it was time for the lace ruffle which goes across the underside of the collar. I used chantilly lace for this, and trimmed the edges so the lace will be longer in the back and shorter in the front. I also saved the bits I trimmed off – they were helpful when it came to making the sleeves! I gathered the lace down by machine. Then pinned it onto the collar. This was almost as time consuming as placing the bands, I spent so long lifting portions by a quarter inch only to drop them again. There was also a big struggle in getting both sides to be symmetrical, but I think I got it figured out! Here it is sewn in place. I love how frilly this is. Everything should involve a minimum of four different types of lace. Then the collar got sewn onto the bodice, and suddenly it started to take shape! I tried putting it on my dress form so you could see how it drapes, but that didn’t work so well. The proportions don’t look right since my dress form doesn’t fill out the shoulder and bust of the bodice. I guarantee that it looks much better when worn. On the bright side it does show how nicely all the materials work together! Now it was time to finish and bone the back of the bodice. I did this by making a one and a half inch wide facing. One edge of the facing was turned inward by a half inch and sewn down to create a boning channel, and the other edge is sewn to the centerback of the bodice. The facing was supposed to be attached with a half inch seam allowance, and hidden by the exterior of the bodice…but when I measured the waistline it was only 25″ and I didn’t want to lose a whole inch of seam allowance. So the facing was sewn with a quarter inch seam allowance and didn’t get folded under completely. Then I sewed a quarter inch away from the edge to create a boning channel. The end results looks pretty bad, but it’s at the back of the bodice so i’m not that bothered by it. The lacing will mostly cover it, and If I have leftover chantilly lace when i’m done making the skirt i’ll stitch some overtop to cover it completely. Boning was inserted, then I embroidered eighteen eyelets into each side. They are spaced more densely near the waist of the bodice since that’s where the most tension will be. I lined the collar with muslin since the interior of it was a mess. And that’s about it! I’m really pleased with how it turned out. I think the materials work nicely together and it’s just as frilly as i’d hoped it would be. I haven’t included a worn photo in this post since the silhouette didn’t really come together until after I added the sleeves. But I promise there will be some in the next post about this project! In the mean time, here is a detail shot. Thanks for reading! I don’t think I have any more bodices in progress right now so the next post will probably be about poofy sleeves and skirts!